Fruits of the Nile Nectars from Egypt are best sellers. 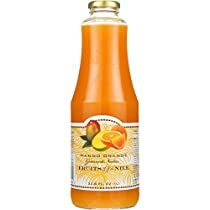 These thick and luxurious fruit drinks are made from the finest hand-picked fruit grown year round in the fertile Nile Valley, and contain up to 30% fresh juice. Fruits of the Nile Nectars come in four flavors: Mango, Strawberry Guava, Mango Orange and Guava. They make great smoothies, ice pops and cocktails.